The stock Sprinter stereo doesn’t have great dynamic range. It does relatively OK in the high end because it has separate tweeters, but the door speakers just aren’t big enough to reproduce low frequencies very well. The head unit doesn’t have a dedicated subwoofer output so you have to get creative if you want to add better bass. Here’s how we did it. We previously upgraded the speakers in the doors and dash. That really helped with sound quality, but didn’t quite go far enough. Even with upgraded speakers, the low end was still missing from the music we were playing. We bought a (relatively) cheap Pioneer TS-WH500A powered subwoofer that’s designed to fit under the seat in most cars. It slots well into the passenger seat base – even the lowered base that we have in our van. In our van it also sits well just behind the driver’s seat lodged up against our cabinets. The subwoofer we chose is not going to blow the windows out with its power, but then we aren’t trying to wake the neighborhood up with our wub-wub-wubbing dubstep bass drops. All we really wanted was to add the low-end back into the music we were listening to. The Pioneer sub has speaker level inputs. That’s important because the stock stereo doesn’t have a line/component level output to power the sub. Instead you have to hook in to the existing speaker cables to get sound to the sub. Luckily, there’s a really good location to do this. The center channel speaker in the middle of the dash is pretty much useless. We unhooked ours when we added aftermarket speakers. It’s fed by both the left and right channels, so it’s an ideal location to grab inputs for the sub. We used 4-conductor 18-AWG cable from Monoprice via Amazon. We ran it from the center speaker location on the dash, through the center console, down through the wiring channel from the console to the driver’s seat base, and from there to the back side of the seat base. You could also run it to the passenger seat base if you wanted to hide the sub away under the passenger seat. Fishing the cable through so we can run it down the console and to the front seat base. 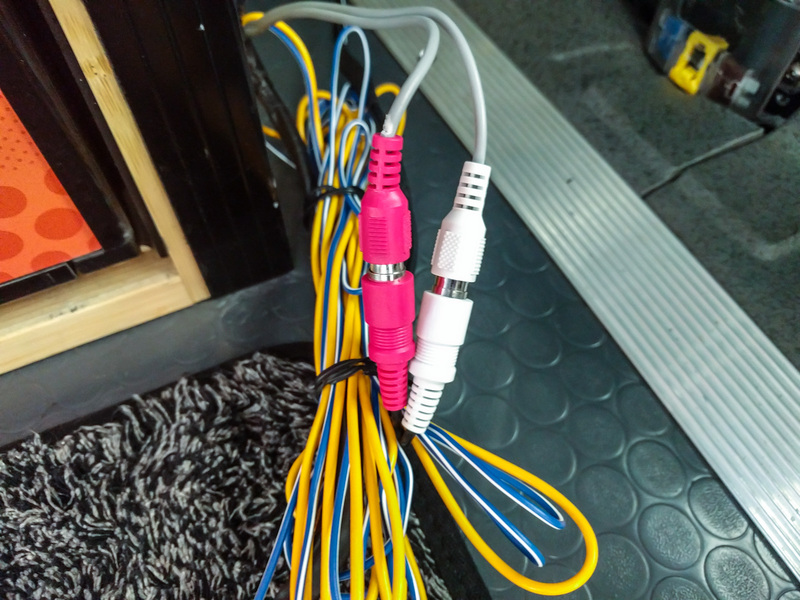 It doesn’t really matter which colors you choose to connect these to in your 4-conductor cable, just so long as you remember which is which when you come to wire the sub up at the other end! The sub comes with a connector that has bullet terminals crimped on the ends. We crimped bullet terminals on to the ends of the 4-conductor cable after we’d run it through to the sub location. This really cheap kit from Amazon contains an assortment of bullet and spade terminals ready for crimping. That took care of getting an audio signal to the sub. Next was power. The sub also needs power, because it has a built-in amplifier. At 150W, it’s not earth-shatteringly powerful which is a good thing because it means you can use the EK1 / X145 battery terminals under the driver’s seat. Because we have the auxiliary battery and we’ve already added a separate fuse panel to that, we decided to connect the amplifier to the fuse panel rather than the EK1 terminal. 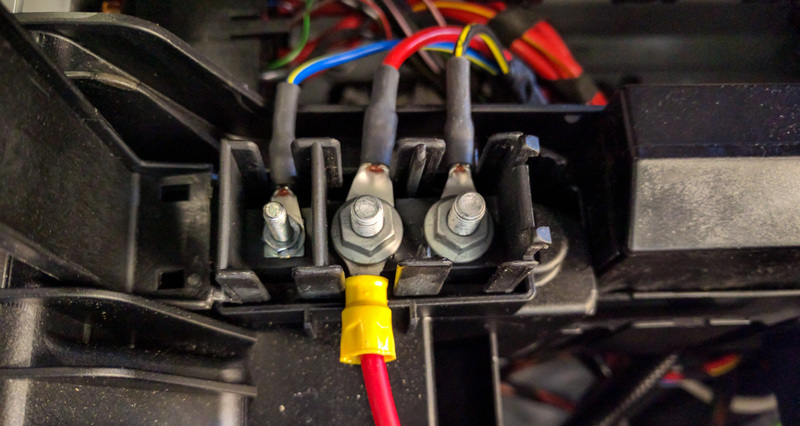 Warning: Disconnect the battery negative terminal next to the accelerator pedal before messing with the van’s electrical system. 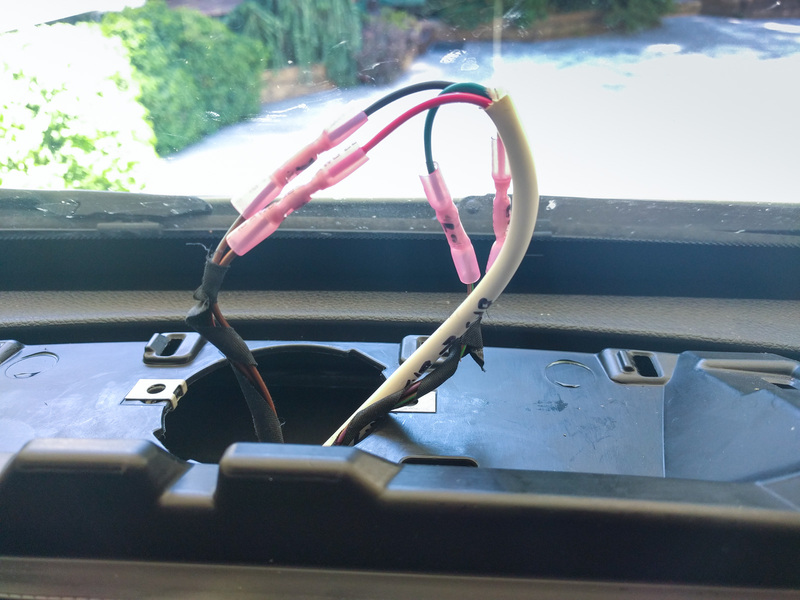 If you’re wiring into the aux battery, disconnect its negative lead under the hood too. The amplifier comes with two positive connectors. One is the main power input (yellow). The other is a remote switch on/off cable (blue/white). When this cable has power, the unit turns on. When the cable loses power, the unit turns off. Aftermarket stereos often have a “remote” or “power antenna” output. This wire is supposed to connect to that output. The stock radio doesn’t have (easy) access to that circuit. 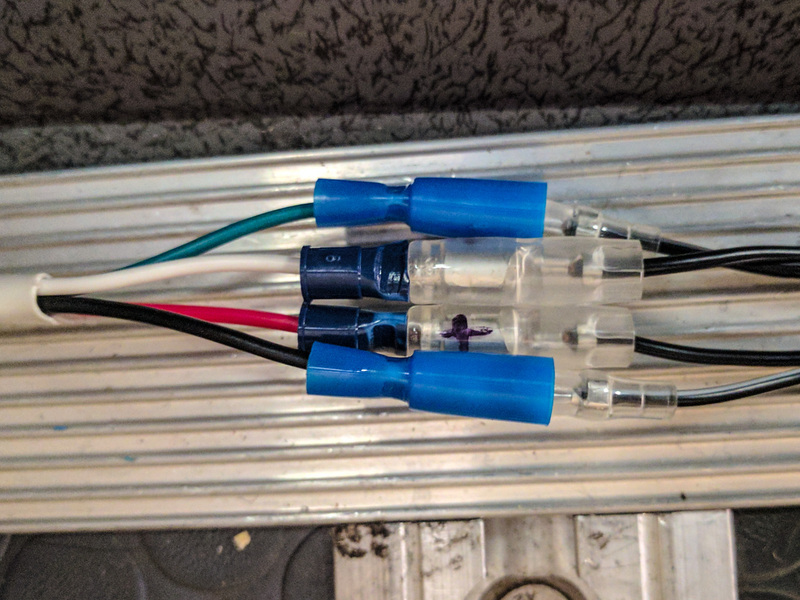 We chose to just connect this cable to the same terminal as the main power cable because our fuse panel is on a relay which means it’s only live when the engine is turned on. If we’d been using the EK1 terminals instead, we’d attach the main power cable to the middle stud (terminal 30) and the remote on/off cable to the right hand stud (terminal 15). A nice bonus is that both positive leads are already fused. If you’re connecting to the EK1 terminal, you won’t have to worry about adding an extra fuse. The cables are really long, too. 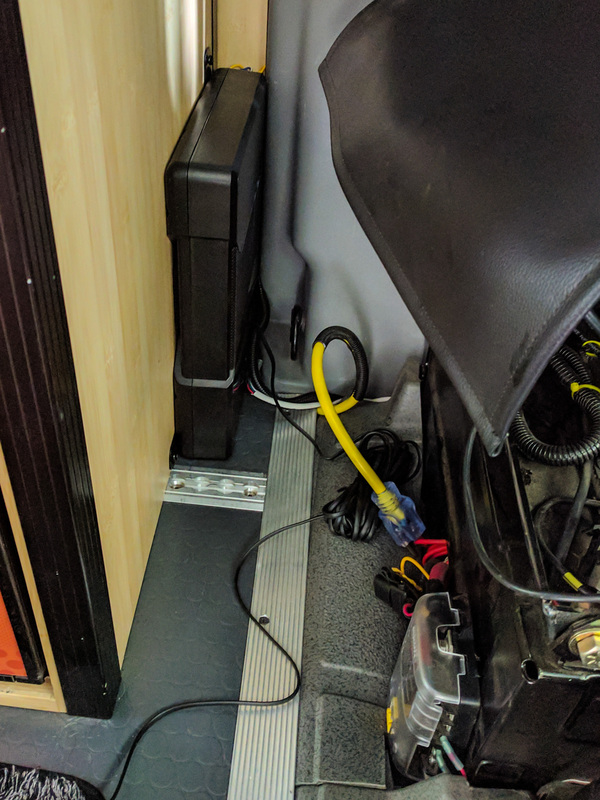 It should be possible to reach from the driver’s seat base to somewhere near the back of a 144 wheelbase Sprinter just using the stock power wires. The wiring harness for the sub plugs right in on the underside of the unit, alongside the wired remote control. Once you’ve wired the sub up and screwed it down so it can’t slide around, it’s time to test it out. Reconnect the battery negative terminal, then put the key in the ignition and turn it to the second position. This should provide power to the sub’s remote activation lead (if you used the EK1 terminals), and the blue light on the remote control should come on. The only two settings for the sub are the frequency at which it kicks in and the volume it plays back at. Play around with those until you find something that works for you. Frequency-wise, if you still have the stock speakers, you probably want the sub to handle everything it can (frequency knob all the way to the right, 125Hz) because the stock speakers are so small. The Pioneer TS-WH500A is designed for smaller cars where the only place to put a sub is under the passenger seat. 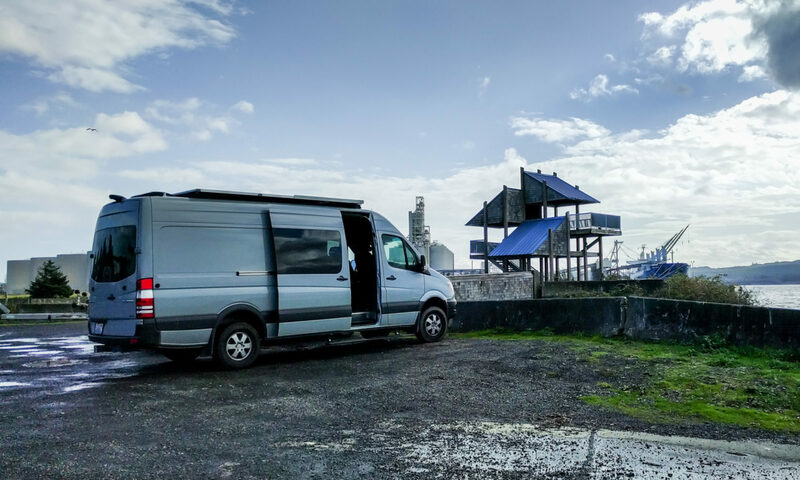 It’s not designed to fill the whole of a Sprinter van with reverberating bass. What it does do well is fill in the low end sound that was missing with the stock stereo and speakers. It’s also a lot cheaper than buying a separate sub, amp, and line-to-component adapter. We bought this unit more as a test than as a long-term investment, but we’ve found that it’s good enough for us. We’ll be keeping it in the van because it adds just enough bass to round out the sound of the music we listen to. 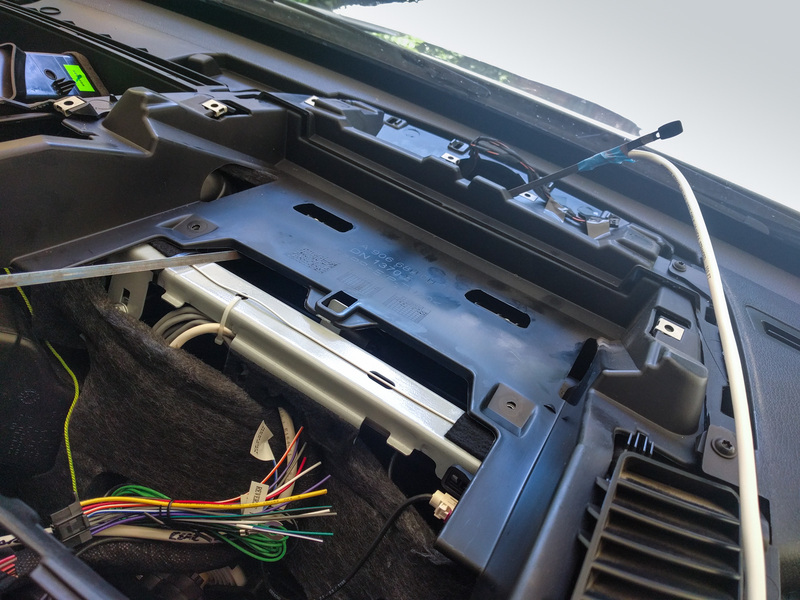 If we moved to an aftermarket head unit with a dedicated sub-out connector, we might re-think our choice of sub units, but for the moment this one works just fine. Note: Stinger sell a 5-conductor cable. Even though the stock stereo doesn’t have a remote power-on output, it might be worth using this cable if you think you’ll be upgrading the head unit in the future. That way, you’ll have the capacity to turn the amp on and off using your head unit when you upgrade. I can’t thank you enough for all the help these pages have offered. As I work through my build I find myself in your page multiple times per day for all the great specifics of has to offer on everything, especially the electrical. Thank you so much. Jake, glad you’ve found the site useful! Have fun with your build. Thank you for the subwoofer recommendation and install instructions. In case anyone else is wondering, the Pioneer TS-WH500A just barely between the top of the drier’s factory seat base and the bottom of the seat itself. I supported it with some leftover 8mm polycarbonate that fits under the seat rails. 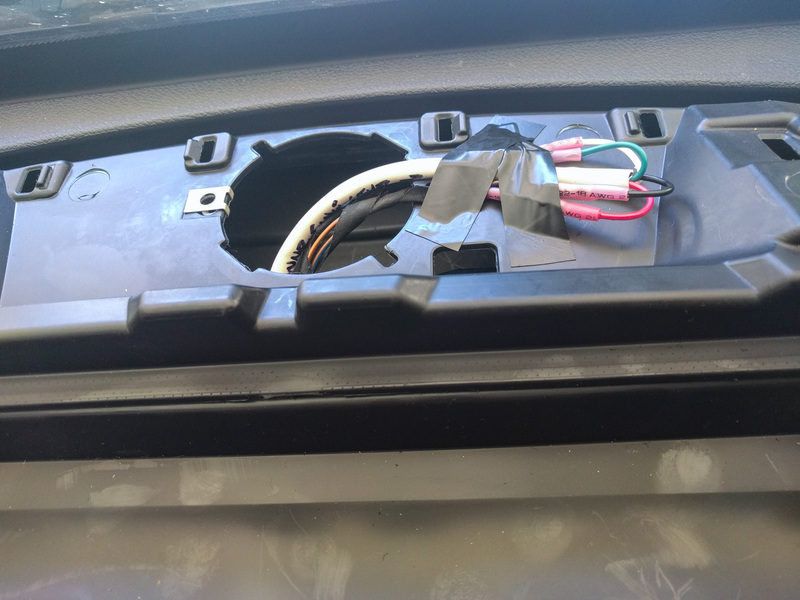 (I had previously mounted a battery charger on the back of the driver’s seat, had all of the DC fuses on the cabinet behind that, and had two group 31 EXT batteries under the passenger seat, so the only place left to put the subwoofer was on top of the driver’s seat base.) While the driver’s seat won’t slide as far back, it was already limited by the stainless steel countertop and it slides far enough back for my 30″ inseam legs. This obviously also wouldn’t work with swivel seats, but my countertop was already too close to the driver’s seat anyway. Thanks for the write up! I am going to add this sub to mine as well. I am a bit confused as to how/where to run the wires from the center speaker hole to the base of the seat. How much of the center console do I need to remove? 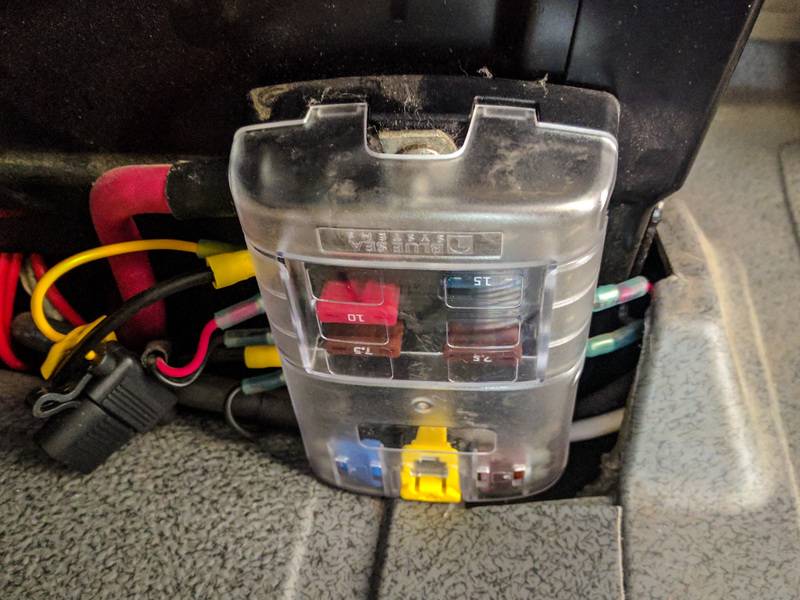 Does the wiring channel begin in the center console, or elsewhere? I assume it is obvious once I open up the center? thanks! Casey, there’s no wiring channel as such. However, there’s lots of space behind the center console. We had the head unit and the top tray out when we ran the wires for the sub, which made it much easier. We still used a wire fish to help pull the wires through. Once you get down to floor level there’s a wiring channel on the floor that leads back to the seat bases. Or, you can just run the wire under the floor mat. The mat is probably soft enough to prevent any damage to the wire. Like you say, it gets easier to work out once you open up the center section of the console. Thanks fo this writeup; I have a 2015 passenger and am trying to do pretty much the same thing. But in my van, Both of the switched EK! Connectors are on only when the key is in the “run’ position, not ‘ACC’, which is the first click position, and when the stereo turns on. Does your connection do that? I’m stumped. Greg, to be honest I don’t think I ever actually tested the EK1 connectors. Instead I relied on Mercedes’ documentation to determine which terminal did what. We ended up using a relay-driven circuit sourced from the aux battery to power our sub. I would go and test the EK1 connectors for you, except my aftermarket seat makes it really hard to access them.